PROUD Aussie actor Bryan Brown doesn’t often talk about the three years he spent in an orphanage as a child, but on Tuesday he broke his own code of silence to share his recollections of the time at a fundraiser in Surry Hills for Japanese orphans. The 63-year-old, who had his beautiful daughter Matilda on his arm at the event, was one of a cast of actors who helped raise $80,000 for a remote Iwate orphanage left cut off following the recent tsunami and earthquakes in Japan. Also squeezing into the Tokonoma restaurant for the party and charity auction were co-organiser Sam Neill and his wife Noriko, David Wenham, Richard Roxburgh, Hugo Weaving, Diesel, designer Camilla Freeman and MC Deb Hutton. Liam Neeson was a promised guest but instead sent apologies from Istanbul, where he is shooting his latest film. He did offer himself for lunch as an auction item, and will entertain a bidder who paid $6000 to dine with him at New York’s Cafe Luxembourg. The event, masterminded by a group of film industry makeup artists and Noriko Neill, Sam’s Japanese-born wife, will enable children to be offered music, sports, art, dance and grief counselling. 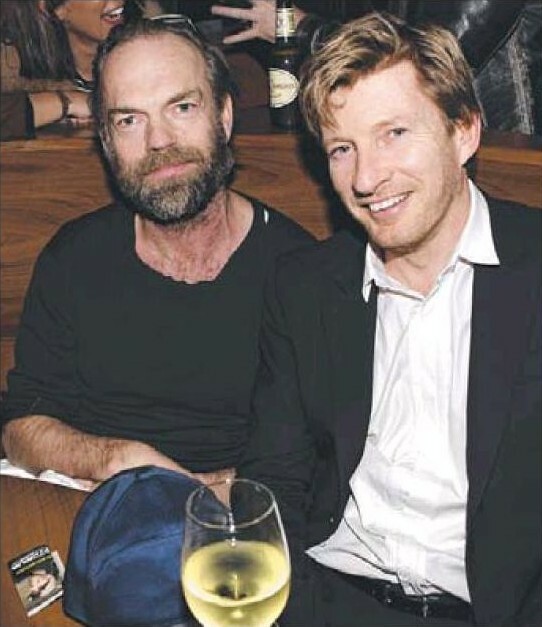 Hugo Weaving and David Wenham; photo: Noel Kessell/Daily Telegraph. More photos from the event (including pics of Sam Neill, Richard Roxburgh and Bryan Brown) can be seen in the original piece. 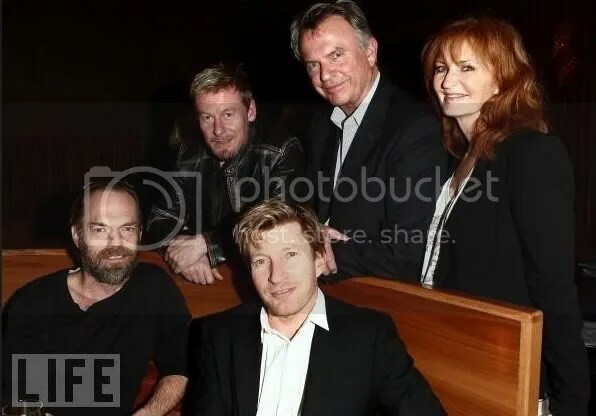 This is the only photo I’ve found of Hugo, but Wireimage has a gallery of other photos featuring Sam Neill and Bryan Brown (who hosted the event) and some of the other attendees. The charity raises funds to help orphans in Japan’s Iwate prefecture whose lives were devastated by the earthquake and tsunami that struck the country’s eastern coast earlier this year. I’ll add any additional news items or photos that become available as I find them. 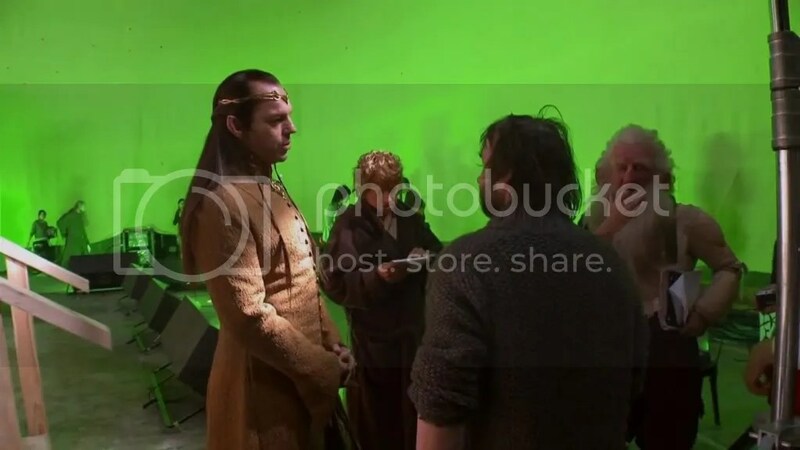 For those wanting a more lingering look at Hugo’s Hobbit shooting, firstshowing.net‘s Twitter feed posted this pic of Hugo with Martin Freeman (as Bilbo) on the set, probably capped from the video. Hugo has been home in Sydney for several weeks now (and spent a couple of weeks judging and attending premieres of films at the Sydney Film Festival last month). So he was probably finished (for the time being) before this new video’s interviews were shot. I know I promised two major Australian magazine features about Hugo’s film Oranges and Sunshine: alas, I’m still waiting for those to arrive. 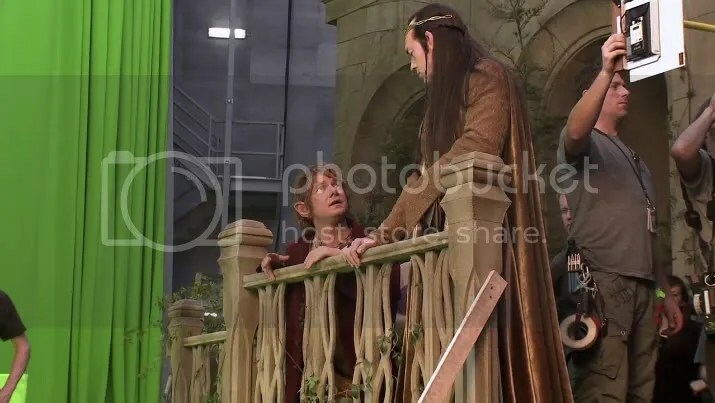 I’ve alerted my source about the issue and hope we can get everything sorted out soon; portions of the articles were posted online at Inside Film and FilmInk. I know I’ve mentioned this before (many times) but in case anyone missed it: Oranges and Sunshine will be released on DVD in the UK on July 25; many websites (including Amazon UK) are now taking pre-orders. 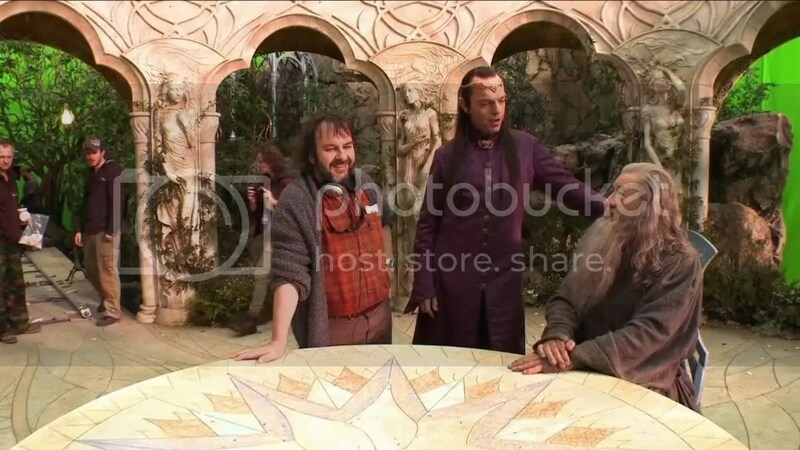 It’s been a week of frustration trying to confirm any news about Hugo Weaving’s current whereabouts or plans… Early rumors suggested he’d attend Comic Con again, but none of the more recent, official reports or event logs mention him. I assumed he’d be in the US this week for various promotional duties or Uncle Vanya rehearsals, but there’s been no news, nor any new video or print interview coverage featuring him. So either he’s not here yet or is keeping very quiet. 😉 (Hedda Gabler split rehearsals for its 2006 New York production between Sydney and New York, so it’s possible he’s still at home.) Then I found this report that Hugo would attend a fundraiser for Japanese ophans affected by the earthquake/tsunami earlier this year. The fundraiser will be held on 26 July in Sydney… but I could only find one blog listing Hugo among the guests. (Sam Neill and Bryan Brown will cohost the event.) It’s possible that Hugo might participate via live video feed or on tape if he is indeed overseas… this does sound like the sort of event he regularly participates in, but I can’t find independent confirmation. Then there were conflicting Variety reports on US distribution of The Key Man… initially they reported that Open Road would distribute Hugo’s film of that title (costarring Brian Cox and Jack Davenport)… then they posted a story that Open Road would distribute a completely different, yet-unmade film that happened to share the same title. IMDb confusingly lists both films on Open Road’s page… but I’m suspecting they just followed Variety’s lead because the film’s producers are active Twitter members but they haven’t mentioned distribution. Also, Variety removed the actors’ names from the initial story which reported that Hugo’s film was the one in question. Confused yet? 😉 I’d love to be wrong and be reassured that The Key Man wiill either open theatrically in the US soon or at least get a DVD release, but right now I don’t have enough to go on. 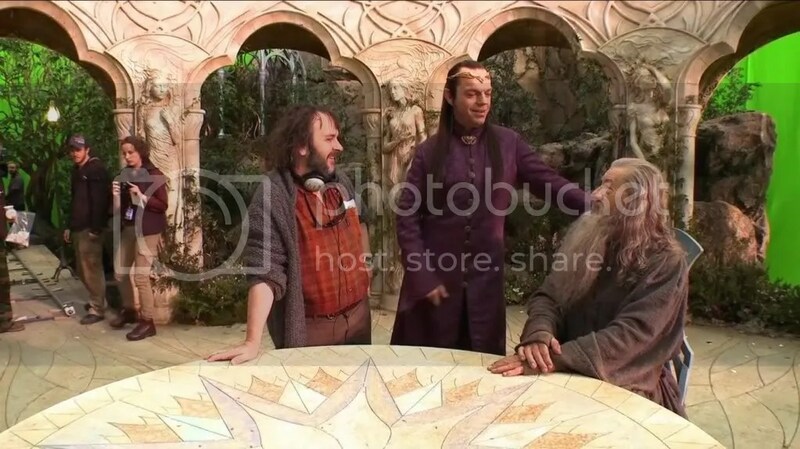 But all suddenly became well when Peter Jackson released the long-awaited Third Production Video for The Hobbit. 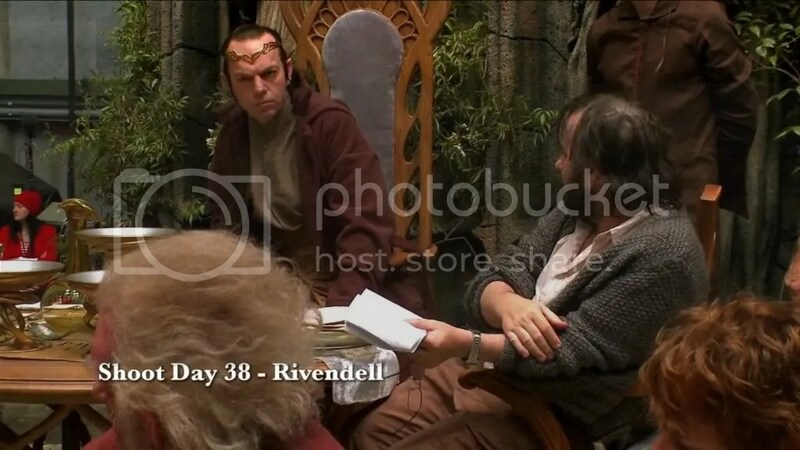 This is easily the best one yet, full of behind the scenes glimpses of all our old favorite actors in character, a hilarious introduction to the Dwarves, some footage in Gollum’s cave and a wonderful surprise at the end which I won’t spoil. Hint: it confirms that Jackson et al are currently filming in London to accommodate an essential old friend (or is he a nemesis?) 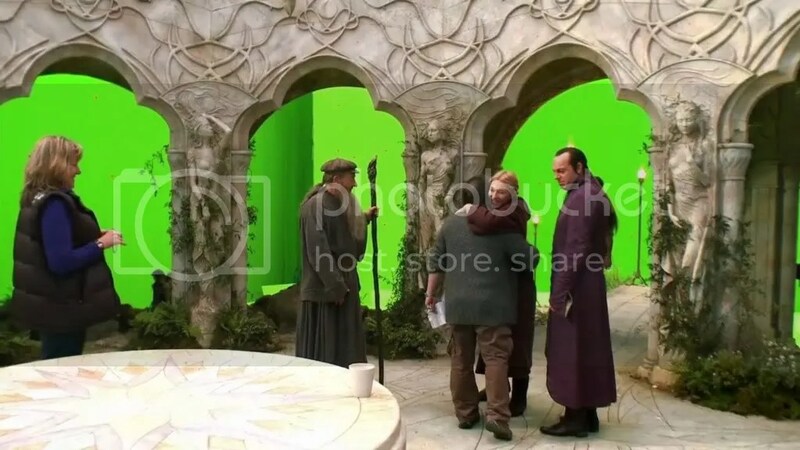 😉 We get much more Elrond footage this time around, in multiple settings and costumes, our first look at Cate Blanchett on set (and in costume fittings) and a set visit from Gimli (aka John Rhys-Davies) who looks in on his forbears on the Bag End set. 😉 While I look for an embeddable version, do proceed with all haste to the original… and enjoy these screencaps I made, with my apologies for any imperfections. I know TheOneRing.net will probably have better ones shortly, but I just couldn’t stop myself. Everything looks amazing, both “just like old times” and promising something completely new. 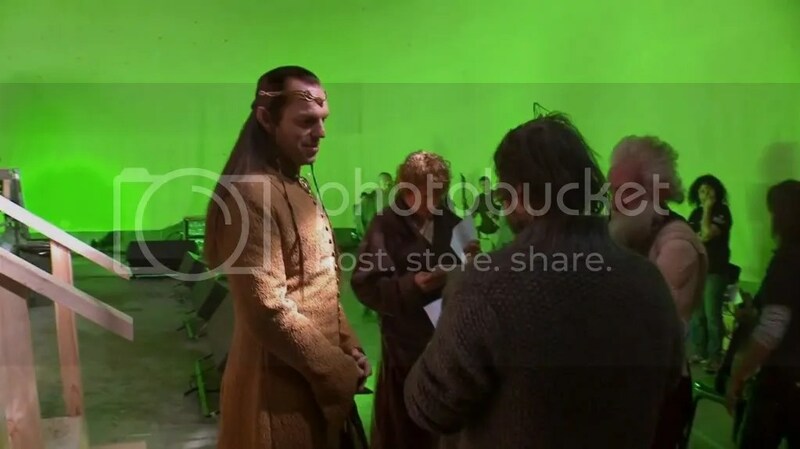 Note: this is a lo-res YouTube copy of the video… I highly recommend visiting Peter Jackson’s Facebook page for the best-quality version.